Connections between HH Holmes and the World’s Fair and Columbian Exposition of 1893 are mostly fictional – though he did claim he was adding a third floor to his building to serve as a hotel during the fair, the “hotel” was never open for business, and the notion that he was preying on fair patrons was just something a New York newspaper casually suggested, and which gradually got folded into the legend. The number of people who came to the fair, went missing, and can honestly be connected to him is exactly one – Nannie Williams, who came to join Holmes and her sister Minnie in Chicago that year. But, while Holmes didn’t see the fair as a great opportunity to murder people, he DID see it as a great way to make money. Nearly everyone in town did. By claiming to start a hotel, he was able to swindle investors, supplies and insurers galore. By 1893, though, he’d already completed his biggest connection to the fair: swindling Thomas B. Bryan, the vice president and “commissioner at large” of the exposition.
. In 1865, he introduced people like General Grant and General Sherman at the Great Northwestern Sanitary Fair. 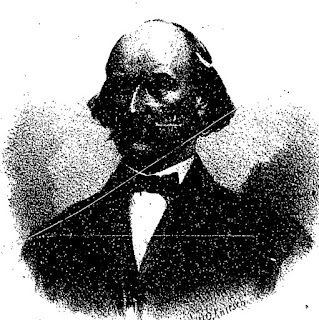 He later served as commissioner of the District of Columbus under President Hayes. By 1891, he was working from an office in The Home Insurance Building (whose steel frame construction made it a landmark itself; the first modern skyscraper) and acting as Vice President and Commissioner at Large of the upcoming World’s Fair. In this capacity, he traveled the world, meeting with people like the pope to promote the interests of the fair. Somewhere along the line, a fellow named Frederick Nind persuaded him (by sheer persistence and making a pest of himself) to become half owner in The ABC Copier Company, a company designed to sell a copy machine for which Nind had bought the patent in England. But Bryan seems to have almost immediately wanted out, as he had no real time to manage a copier machine business himself, and Nind began to look for a buyer. In late 1890 or early 1891, he met HH Holmes and told him all about the opportunity. The connection to Bryan is what seems to have interested Holmes the most; H.W. Darrow, who ran a cigar shop in Holmes “Castle” building, later said that Holmes told him that this Bryan fellow seemed “like good fruit for a sucker.” Holmes offered to buy his half share of the business for around $7000. Bryan agreed, on the condition that his name not be used to establish credit or connections. Holmes paid him with a promissory note, the proceeded, naturally, to use Bryan’s name to establish credit and connections all over town, eventually borrowing thousands of dollars that he had no intention of repaying. Q: Had the business which this company was organized to carry on been previously carried on by some other company, firm or person? A (Bryan): No, but it has since February 1891 been improperly attempted to be carried on by a man by the name of Holmes. Q: The same one who is now president of the company? A: He has no office. He assumed some office, but he was never appointed. Q: He assumed the office of manager? A: I don’t know what he assumed, but he assumed something. He never was actually appointed. He was an assumed officer. The sheer amount of the promissory note, which Holmes (of course) never paid off, may qualify Bryan as Holmes’ single biggest swindling victim. His frequently given motto, “Take care of details, beware of cocktails,” indicates that he was what we’d now call a “detail oriented” man; in his notes to investors and his deposition, you can see how frustrating his light dealings with Holmes made him – it almost seems that it’s less about the money and more about Holmes’s exasperating tendency to obfuscate details! Bryan died of heart trouble in Washington D.C. in 1906; he is buried there, far away from the cemetery he founded. Was Rosehill Supposed to be Roe’s Hill? 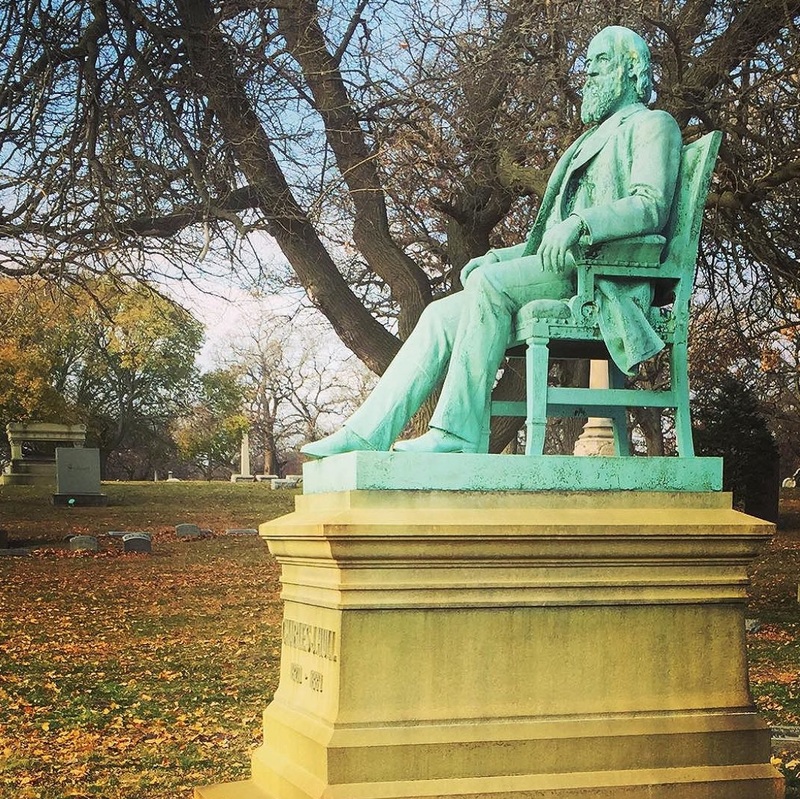 The proper name of Rosehill Cemetery is up to some debate. Though most official paperwork gives it as a single word, Rosehill, it’s not uncommon to see it written as Rose Hill. And several popular stories claim that the name was supposed to be Roe’s Hill, and only a clerical error resulted in the name we know today. People ask me about it on tours all the time. The oft-given story is that the land, seven miles north of downtown Chicago, was once a farm (or tavern) owned by a stubborn old pioneer named Hiram Roe. When someone wanted to buy the land from the old man for a cemetery in 1859, stubborn old Mr. Roe only agreed when the buyer promised to name the cemetery after him – but a clerical error resulted in it being named Rosehill instead. I love to imagine Old Man Roe sitting there on opening day, gnashing his teeth and sipping his homemade whiskey from a brown bag while wealthy Chicagoans sat through the speeches and picked out their plots. But, while there’s reason to believe Roe was a real person, the story of him wanting to have the cemetery named after him is certainly fiction. The land wasn’t bought from him, and wasn’t intended to be a cemetery when it was first purchased. Lawsuit records recorded in The Northeastern Reporter in 1895, when a suit over payments was going on, elucidates the whole story of how the land changed hands: In 1857, Francis H. Benson bought the land where the cemetery now sits, then in the surburban town of Chittenden, for about $25,000 from the Illinois and Wisconsin Land Company. He intended to parcel it out into lots for houses, but the Panic of 1857 hit the economy hard, causing the land to lose about half its value and decimating the market for suburban real estate. The only money Benson made from the land in the first year came from selling off a bit of gravel he found on it. But the dryness of the soil (it was a high elevation) made Benson think some of the land would make a good cemetery, so he partnered with James V.Z. Blaney, first president of Rosehill, to form the Rosehill Cemetery corporation. The company was incorporated in February, 1859, and the cemetery opened for business that summer. Benson and Blaney’s names are both carved onto the gate. When the cemetery published a promotional book in 1913, they said that the name came from wild white roses that grew on the hill. But the story that the name of the cemetery may have grown from a hill named for Mr. Roe may not be entirely fanciful; while the “stubborn farmer who owned the land” tales are of decidedly modern vintage (probably just the last couple of decades), stories that the land was once called Roe’s Hill appear in several 19th century sources. The first mention that I can find comes from just over 20 years after the cemetery was chartered, when the Chicago Tribune ran an article about onion farming on September 6, 1880. In the article, it said that in the early days of Chicago history, teamsters traveling in the woods seven miles north of town would often stop at the “Jug Tavern” owned by “old Man Roe,” who made a sort of whiskey that was popular enough for its fame to make them start referring to the area as Roe’s Hill. A few years later, A.T. Andreas’ authoritative History of Cook County mentioned this as well, stating that the area of Bowmanville was once known as Roe’s Hill for Hiram Roe, whose cabin and tavern were near the current residence of one J.A. Budlong. However, census records say nothing about a Hiram Roe in the area. There was a farmer named Hiram Rowe up near McHenry in those days, but I couldn’t find any evidence that he ever lived closer to the city. Furthermore, these mentions that the area was called “Roe’s Hill” in the old days (1830s-1850s) are all from a few decades later; no instance of anyone calling it Roe’s Hill in the actual “old days” has yet been found (though I’ve heard rumors about it being in some early Rosehill documents). Andreas and the Tribune may have just been repeating neighborhood gossip and urban legends. Perhaps the tale that Rosehill was Roe’s Hill may have all been a misunderstanding; In 1856, Robert Ferguson wrote a book on Danish and Norse names in Scotland, and said that a Rose Hill in the U.K. was, he believed properly Roe’s Hill, from the Old Norse word for “King.” Perhaps someone heard that bit and thought it applied to the Rosehill in Chicago. Still, the fact that sources knew the full name and even the location of the tavern make it look as though there was a kernel of truth in the story someplace. So, Old Man Hiram Roe remains a bit of a mystery; I spoke to Larry, a fellow tour guide who works at Rose Hill, and he said he’d pored through all of the oldest books looking for any mention of Hiram Roe without finding a thing. “He’s certainly not here now,” he told me. When I run Rosehill tours, I mostly stick with the eastern sections. But at least one detour is always in order: you can’t leave out Lulu Fellows, the glass-encased statue of a young girl who died in 1883 at the age of 16. Her epitaph, “Many Hopes Lie Buried Here,” is not unique; it shows up on other 1880s graves in the cemetery as well, and, really, could be added to almost any tombstone. But next to the statue (carved by AE Gage, who also created the “Inez” statue at Graceland), it really brings home the fact that we’re looking at a young woman whose life was cut tragically short. For the longest time, little was known about Lulu beyond what one could piece together from census forms and her death certificate, but the digitization of newspapers and books has made a few more tidbits available, shedding some light on the sort of “hopes and dreams” that died with Lulu. A student at the Park Institute, at Ashland and Ogden at Union Park, Lulu studied under Professor Dickson, himself a noted elocutionist, and was a member of the C.E.G. society – which presumably was somehting to do with elocution, though I can’t for the life of me find out what it stood for! Sometimes listed as the “C.E.C. Society,” it seems to have existed at no other school. But the society gave performances at churches and homes around the city (particularly those near the school), and the press often mentioned the performances. Most of the time, the reviews only noted that Lulu performed a “recitation,” though a January, 1882 write-up of a performance at Third Presbyterian Church specifically mentions that she performed “The Brakeman at Church,” a comic piece in which a railroad man compares various religions to railroad lines. Like most Victorian comic pieces, it doesn’t seem very funny by modern standards (you can read it here), but the Tribune noted that she performed it “very acceptably and responded to a hearty encore.” The perfomance closed with the society (presumably including Lulu), giving a “tableux of statuary,” enacting poses of such scenes as “Columbia Mourning Over Garfield” (another style of performance that died out in the 20th century, remembered now almost entirely because of a satire in The Music Man). Reading “The Brakeman at Church” today may not be thrilling, but to look on the statue of Lulu over her grave and imagine her reading it can be a moving experience, add a bit of life to the stone. Some reviews of the CEG Society performances note that crowds tossed things like bouqets at the stage; who knew that the people slipping money into the glass case around her statue were just carrying on the tradition? Professor Dickson published a magazine, published in book form, called The Elocutionist, which gives an excellent idea of the course of study Lulu would have followed, what other pieces she might have performed in class or in recitals. It can now be read on Google Books. 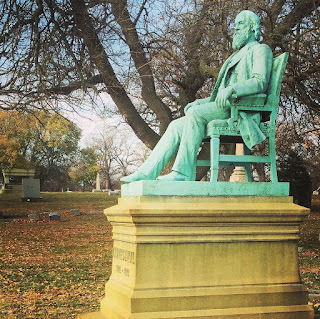 As a cemetery tour guide, on my favorite things is finding great stories that have escaped the history books – it’s often just a matter of finding an interesting headstone and looking up the name. But which stones to choose? The most obvious are the big and impressive ones, but sometimes it can also simply be a person with a strange name, or an interesting symbol. One of these was Elizabeth Ely Gridley Butler, whose stone includes a “Real Daughter” plaque, signifying that her father was a Revolutionary War soldier. These are very rare in Chicago, where no verifiable Revolutionary War veterans are buried (we’ve covered the two supposed ones, William DuVol and David Kennison, a time or two before). But what struck me about Elizabeth was her birth date – 1826. I figured there had to be a story there, as the youngest Revolutionary Veterans in 1826 would have been comfortably past middle age. As it turns out, her father, Theodore Gridley, of Clinton, NJ, served for seven months in the New York state militia during the war; family legend a century later said that he fought in the Battle of Bunker Hill (the war service is backed by records, though they indicate that the Bunker Hill part was probably not true). It wasn’t until around 1816 that he married Amy Ely, who was already 40 years of age – very old to be getting married in those days. In 1825, according to an 1875 Tribune article, the two of them rode in a carriage to Boston to see the cornerstone laid for the Battle of Bunker Hill memoriale, and heard Daniel Webster speak. Amy was nearly 50 years old when Elizabeth, her only child was born; Thomas died the next year, and Amy moved to Chicago in 1854, when her daughter married G.S. Butler there, and lived there for a rest of her life. The family hid in a cabbage patch outside of the city limits during the Great Chicago Fire, by which time Amy was close to 95 years old. Amy Ely-Gridley died in her daughter’s home in 1876, and, at 99, was thought to be the oldest woman in Chicago. According to Graceland Cemetery records, she is buried in the unmarked spot directly next to her daughter’s. I’ve exchanged a few emails with the D.A.R. in hopes of getting a marker placed there, but nothing has come of it yet (possibly because Amy was Theodore’s third wife). Here’s hoping! Amy is a part of history who deserves a memorial of her own. On a recent walk through Rosehill Cemetery, looking for new stories to tell on tours, I came upon the gravestone of Albert H. Dainty, whose epitaph read “Until the day breaks and the shadows flee.” This was a line from The Song of Solomon in the Bible. Translations vary, but the full line is something like “Until the day breaks and the shadows flee, turn to me, my beloved, and be like a wild elk among the rugged hills.” Go, Albert H. Dainty, go! Some research showed that this epitaph would have certainly been chosen by his second wife; his first, Laura, left him to go on the stage, ignoring his pleas to come home for a decade before he finally obtained a divorce. She was a fairly well-known elocutionist in her day, and turned out to have connections to any number of other people in Rosehill (though she herself is in Forest Home). Later in life, she was very active in the Hull House theater, where she directed a performance of a play called Hazel Kirk in 1917 as benefit to raise money to get a retired actress named Kathryn Evans into the Episcopalian Home. I was delighted to find the connection to Evans, whose nondescript gravestone on the north side of the cemetery is one of Rosehill’s many little-known treasures. Evans was an actress, and a fairly popular one in her day, though what earned her a place in history was her role as Mrs. Sharpe, a housekeeper, who had the first line in a comedy she later said “Wouldn’t be considered very funny today.” That comedy was Our American Cousin, and Ms. Evans appeared in it at Ford’s Theater the night Lincoln was assassinated there in 1865. The details in the story she told of that night – over and over for the rest of her life – seem to change a bit in the telling, but she gave a particularly vivid description to a Chicago Daily Inter-Ocean reporter in 1914. “I was in the green room,’ she recalled, “chatting with Maggie Gourlay, the ‘Skillet’ of the play, and waiting for my cue, when I heard the shot ring out…. I knew when I heard the shot that it couldn’t be a part of the play…. A moment before young Booth had leaped to the stage. I heard someone shout ‘Stop that man! '”… I looked up and saw Lincoln unconscious, his head drooping on his breast, his eyes closed, but with a smile still on his face. Evans went to a dressing room, where she wiped the makeup off her face, certain that any second a detective would knock on the door to arrest her, too. Eventually the property manager assured her that she was safe, and she walked into the empty theatre, which wouldn’t see another audience in her lifetime. Her husband was arrested, but released. The property manager was held in the federal jail in the capitol building for a time, and his frantic wife lived with Evans for a bit. In the heady hours after the assassination and Booth’s seemingly easy escape, everyone in the theater was under suspicion. Years later, visiting Washington for the first time since 1865, she visited the federal prison and was appalled to see a guard prodding an elderly prisoner with a bayonet. She loudly protested, until the guard said the prisoner, was “Still a rebel at heart; he told me he was glad the blankety-blank old rail splitter had been killed. “Give him an extra prod for me, then,” Evans said. Evans remained an actress for years, eventually retiring in Chicago. In 1920, a play about Lincoln was performed at the Blackstone Theatre (now the Merle Norman), and Evans viewed the play from a box, where she sat alongside Sgt. A.W. 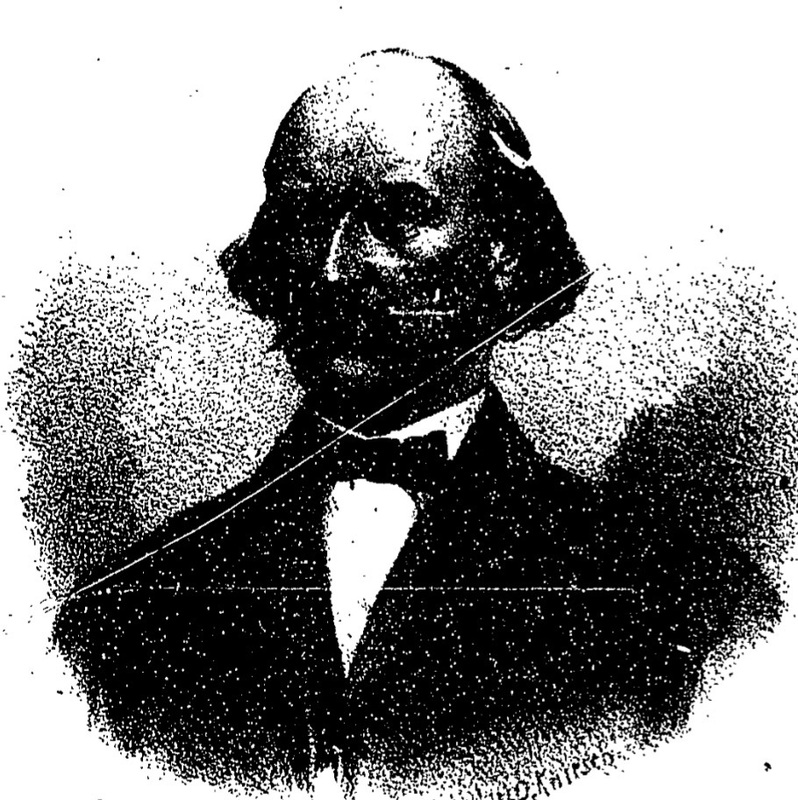 Boggs, who’d been in the audience at Ford’s Theatre that night, and W.J. Ferguson, who’d been in the cast with her that night. They hadn’t seen each other since, though Ferguson was still a working actor; he was currently appearing in the The Little Whopper at the Studebaker, and had recently played Lincoln in a silent film. I’m indebted to Dave Taylor and Kate Ramirez, Booth family scholars who told me about Evans; we located her grave at Rosehill over the summer when they came through town on their “Boothie Road Trip.” Check out his site boothiebarn.com!